After arriving at the Schiphol Airport I knew I had a long day ahead but couldn’t wait to get started. While the plane was landing I had noticed how unique the land was; the grasslands looked like they were broken up into grids creating an interesting landscape altogether. After reading information on how this came to be in the first couple chapters of The Dutch and their Delta, I was interested to get to Amsterdam and start learning about how the Dutch manage their water. We spent some of the first day getting all the students together while the later flights landed, giving the early arrivals some time to walk around and get familiar with our surroundings. I enjoyed going to a cute cafe with some of the other students on the trip and getting a chance to get to know each other. Once the bikes arrived it really started to feel like the trip was beginning. We were able to go to the grocery store via bike and get adjusted to them while still exploring our neighborhood in Amsterdam. 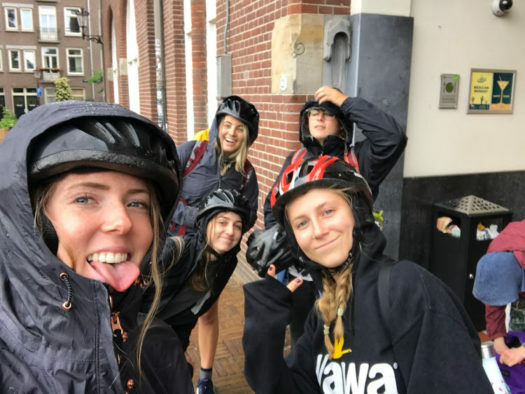 I enjoyed having this first day to adjust to the time change (even though we were all deathly tired all day) and connect with the group and learn a little about Amsterdam before starting the bike tour to all of the water sites and activities we had planned. As people were coming throughout the day, I began to get more and more excited about the trip. Although it was the first day, I enjoyed the group we would be travelling with very much and couldn’t ask for a better bunch to be biking through the Netherlands with. Biking to the grocery store and starting to actually plan out our meals and what our journey would be like was really exciting. The trip was finally in motion leading up to our meeting discussing biking techniques and other guidelines for the trip, along with name games in order to get to know the group. The real excitement was begining as we prepared to spend the next two weeks trekking across the country by bike together.